At the corner of New York Avenue and Thirteenth Street was the church, less than four blocks from the White House, where President Lincoln normally worshiped. 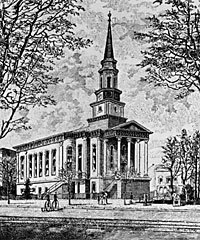 (The existing church is a replacement for the one that existed during the Civil War.) It was a relatively new building, having only been built the previous year. The President apparently attended for the first time on April 14, 1861 – the same day that Fort Sumter in Charleston, South Carolina was forced to surrender. Fortunately for the Lincolns, the congregation of the church was reliably pro-Union. The two younger Lincoln boys, Willie and Tad, were enrolled in the church’s Sunday School but Tad preferred to attend Fourth Presbyterian Church with the Taft boys and their sister Julia. The pews provided little room for the President’s long legs. Mr. Lincoln exercised his presidential privilege to stand during services when he so desired (while others were seated) — particularly during prayers. In order to assure his privacy when he attended Wednesday night prayer services on the lower level, President Lincoln usually stayed in the pastor’s study where he could listen but not be heard. The President attended his first service with his family on the Sunday after his inauguration in March 1861. Elizabeth Todd Grimsley recalled that after of the First Battle of Bull Run in July 1861, “that beautiful moonlit Sabbath evening there was a wedding in Dr. Gurley’s church. His daughter was married to a young army officer, amid flowers, music and light. They left the church together, and then separated in the course of an hour – she to wait in her father’s house the results of the war, he to join his regiment on the battle-field. The streets echoed the clattering hoofs of hurrying cavalry, regiments marched to and fro, bayonets glistening in the moonlight, and the heavy sound of rolling army wagons dispatched for the wounded soldiers, and army baggage, were the sights and sounds we heard and met as we went home from that sad church wedding.””2 Other Administration officials and friends who attended the church included Attorney General Edward Bates and Senator Orville H. Browning. Elton Trueblood, Abraham Lincoln: Theologian of American Anguish, p. 74. Elizabeth Todd Grimsley, ‘Six Months in The White House, Journal of the Illinois State Historical Society, Vol. XIX, October 1926, January 1927), p. 66. Benjamin Thomas, Abraham Lincoln, pp. 469-470. Michael Burlingame, Inside the Lincoln White House, William O. Stoddardp. 176. Michael Burlingame, editor, Lincoln Observed: Civil War Dispatches of Noah Brooks, pp. 13-14. Dr. William J. Johnson, Abraham Lincoln the Christian, pp. 13-15. Burlingame, Lincoln Observed: Civil War Dispatches of Noah Brooks, p, 193 (April 16, 1865).